Final Fantasy: Brave Exvius is a smartphone-exclusive FF title from Square Enix. A pocket RPG, the game includes your favorite Final Fantasy (FF) characters from past games. 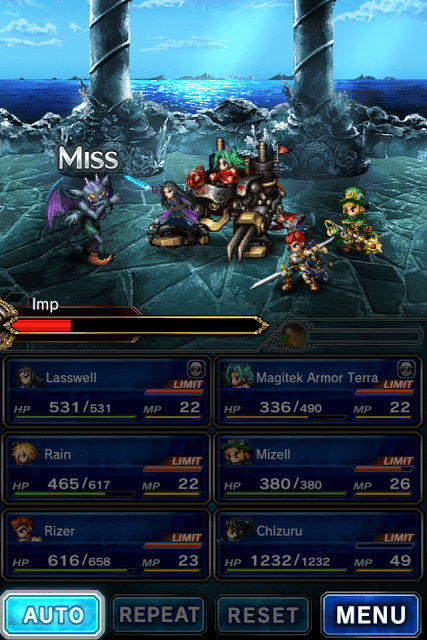 Gameplay is very reminiscent of old school FF, but the battle system has been simplified to appeal to smartphone users. There are several familiar elements, such as magic spells, limit breaks and unit summons. Town exploration has a classic RPG vibe and is very similar to RPG-maker games. You can move your character, interact with villagers, get tasks from them and complete them for rewards. Auto-battle is a great way to pull off chained attacks. Go for it if you have a party of five units and a high-HP/ATK battle companion. The AI is pretty smart and quick to combine attacks from multiple units to perform one. However, there’s one drawback. In auto mode, units normally don’t use magical abilities and Limit Breaks. You don’t have control on your units or have the freedom to select actions for each unit. This can be a bit problematic if your squad is facing a tougher villain or a powerful boss. What you can do is go auto mode until the boss round and then manually select units and assign actions to them. By the time your squad reaches boss round, some units in your squad will have their Limit meter filled. Throw Limit breaks and use their magical abilities (requires Mana points) to inflict max damage to them. Before battling enemies, you will be given an opportunity to borrow a random player’s leader character for a battle quest. Also known as “companion”, the friendly character in your squad can be of immense help in fighting enemies. However, you can’t use a companion’s abilities in battle. While it’s totally up to up to you to choose a battle companion, I would recommend selecting a high-HP character. I normally choose a companion that has a 4-digit HP value. A high-HP battle companion cannot be easily defeated in battle and can be very handy in boss battles. You can also select someone that boasts great stats and has a better level, but make sure their HP is higher as you will have to withstand at least 4 battles in a battle quest. If the companion list only has Rain, scroll down and you might find a different character. Friend points are quite easy to earn. You get 25 friend points when you take a companion with you to battle. But if you take a friend of yours, be it a Facebook friend or a random player you have just befriended, you will earn more friend points. To befriend a random player you can send him a friend request and if he accepts it, you can get double the friend points when you take him to battle. Similarly if you accept a friend request from a player, you will receive double FF points when you take him to battle. Friend points can be used to summon units. 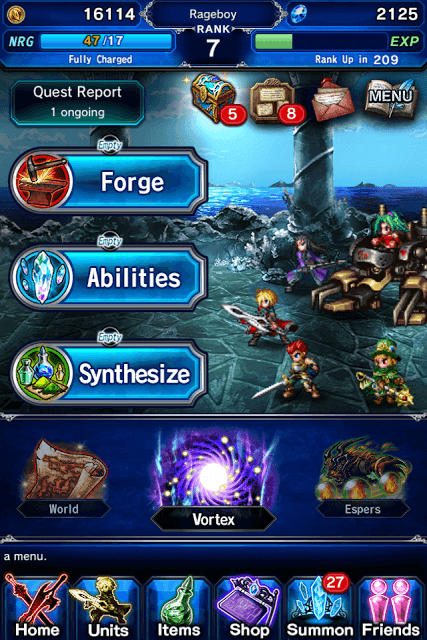 On your home screen, tap “Summon” and flick the screen to go to “Standard Summon”. This is where you can summon a unit for 200 friend points. 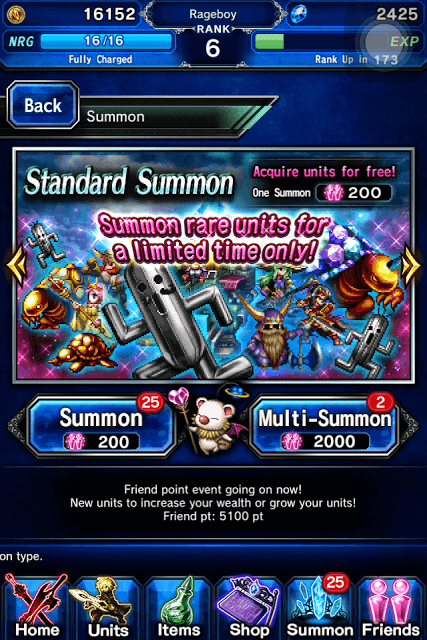 Try to use up all friend points to summon units if there’s a limited time event that provides rare units for standard summons. Featured summons normally contain better units than Standard summons. But you will need to spend lapis to summon a featured unit. You might receive lapis after clearing an entire stage. Each stage contains quests and each quest contains a set of battles. Completing all quests in a stage will earn you some Lapis. You also get 100 Lapis after ranking up. Keep completing quests to acquire rank EXP points. Once the Rank EXP meter fills, you gain a new rank and obtain 100 Lapis. Don’t not to use lapis to revive your party or recover energy. Instead save them for featured summon if you want better, rare units. If you want total control over your squad and don’t like the AI battle on behalf of you, you can manually select your units to attack enemies. You can also assign an action to each unit. There are four main types of actions – Attack, Guard, Ability and Items (potions etc.). Swipe down on a unit portrait to change its action to “Guard” and then tap it if you want that unit to guard against attacks during enemy’s turn. Swiping up will bring back the default attack action. Use Guard wisely. You can assign Guard to a unit who has received massive damage, is injured or is vulnerable to the attacks of a particular enemy. Assigning Guard will limit damage dealt to your unit. Swipe towards right and the abilities section displays LB and magical abilities. You should do this when a unit’s Limit Break gauge is full and he/she has a few magical abilities up their sleeve. Magical abilities require mana. Select ability and it will be assigned to that unit. In case you want to heal a unit, just swipe left and tap a potion to heal a unit. You can assign actions to each unit in your squad and then hit the Auto button. You can also tap each unit’s icon once you have finished assigning actions to your squad. So if you assigned “Guard” to a unit, he/she will defend an attack from an enemy during enemy’s turn. A unit that has been given a magical ability or LB will perform that action and if a unit has been given a potion, then his HP will be restored to some extent. Each unit in your squad should be equipped with the strongest weapons and armor. Weapons can be acquired from chests lying scattered in and around the Town of Mitra and other towns, or can be purchased from the “Weaponsmith” (house with a Sword icon). To purchase shields, plates, shirts, hats, go to the “Armorer” (house with a Shield icon) in town. Similarly, you can get items from chests that appear randomly in exploration maps. An exploration map usually appears when all quests in a location have been completed by a player. You can buy blueprints of weapons and other items if you want to save Gil. They cost cheaper than a forged sword, staff, shield etc. A weapon or an armor blueprint contains the recipe to craft that particular item. Before buying a blueprint, tap “Details” beside the item icon to check whether you have the required materials to craft one. The blueprint info screen will show the recipe and also show whether you have those materials or not. 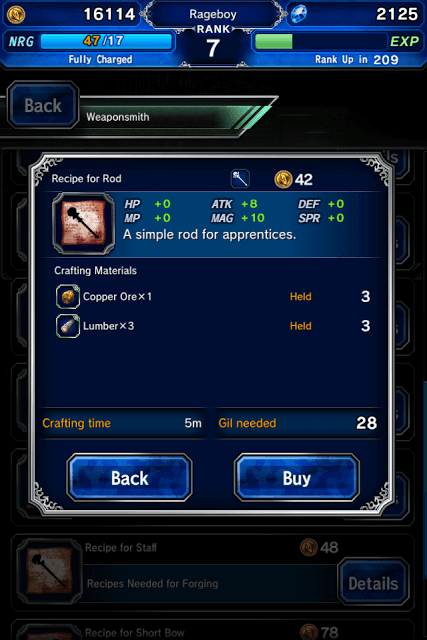 Before buying an item that can be equipped to your character, tap “Details” to see whether that item can be equipped to a unit and whether it provides any stats boost or not. You can see that in the “Equippable Units” section. It shows the faces of those units who can equip that item. The numbers beside them shows stat boost. 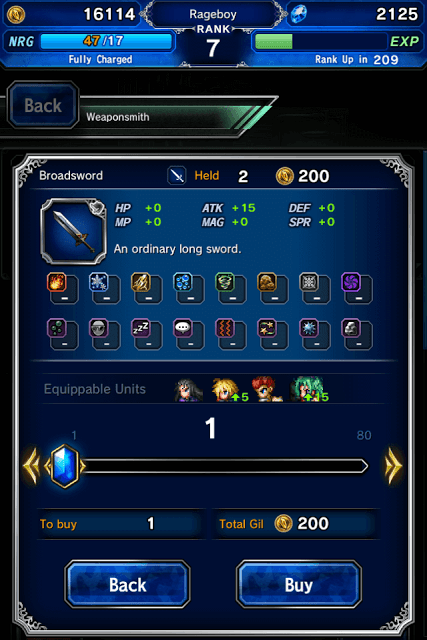 If the number beside a unit is in green, it suggests that the item will provide some stats benefit to him. If the number is in red, then it would weaken certain stats. You can also sell unwanted items. I wouldn’t recommend selling materials as each material can contribute to creating something powerful, magical or strong item. To know what purpose a material serves, tap “Menu” located beside Mailbox and then press the “Guides” button. There you will find information about each item, materials, equipment, unlocked abilities, recipes, units and monsters. 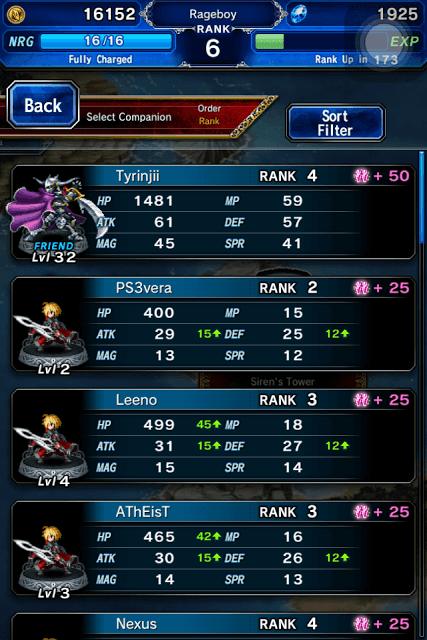 In Final Fantasy: Brave Exvius, enhancing is the best way to level-up your units faster. When you enhance a unit, you fuse other units with it to gain quick EXP. An enhanced unit will have improved stats. And if the material unit is powerful, then the target unit will gain plenty of EXP and reach higher levels. However, do remember that units used as fodder for enhancing your main unit will be gone forever. So try to select those that you don’t need. You can use duplicate or unwanted units to fuse to the unit that you want to enhance. You can increase Trust Master Percentage by fusing an identical unit with your main unit. Once it hits 100 percentage, you receive a Trust Master reward. Now this reward is available with some units. The TM percentage can be increased occasionally after completing battles. Trust Master Rewards can range from a brand new ability to a 10 percent increase in HP. Do remember that not all units grant Trust Master Rewards. The Dimensional vortex can be accessed via the Home screen. It is located beside the “World” map. Tap “Vortex” to open a set of dungeons or special quests. Each dungeon contains unique rewards or loot. The Chamber of Creation will let you earn materials for forging, synthesis etc. The Chamber of Awakening rewards materials to awaken units. Completing the Chamber of Experience quests will help you acquire EXP for your units. The chamber of riches rewards gills. Select your dungeon based on your needs. If you need materials for crafting weapons and items, choose Chamber of Creation where chances of getting materials are more. You can unlock only one dungeon in a day. To unlock more dungeons, you will have to spend lapis. Save lapis for featured summons and choose the dungeon wisely, based on your requirements. Early game, add friend and just build friend points, FP standard summons are garbage but you can fuse ones with the same unit name together for trust master rewards that can be used well into your rank 1-20’s. Never sell your materials ever. Gil snappers are your main way to gather currency and many, many, many event give you them and for most the game you don’t need gold for jack until much later. Do the story map quest, every roaming dungeon or town you go into run against walls for secret passages to chest, do all the quest and talk to people. Also buy gear as it’s cheap and easy to get. Much easier then wasting materials you won’t use at all later. Quest give you abilities, equipment etc as you get further the better equipment you will get for cheap, anything better will come from trust rewards or special events. Also talking to certain NPC’s can unlock roads to better Espers. 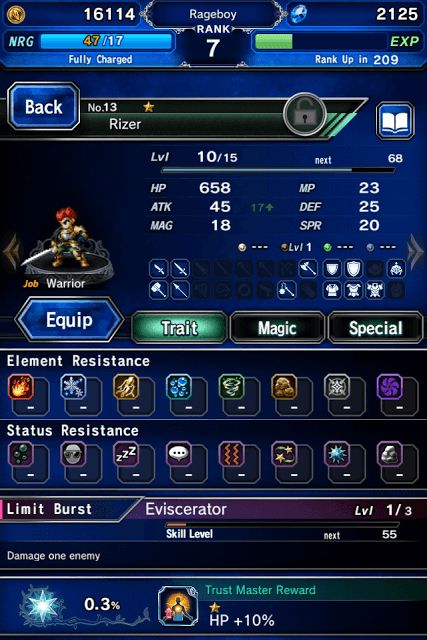 Espers, you need them, as you level Espers up and train them all base stat bonuses trained get a 1% transfer rate to the equipped unit, the equipped unit also gains any abilities the Espers gain. PvP? Yeah don’t even try until you have 5, 6* units with awakened abilities and decent equipment. Don’t fret because there are coliseum quest that you can do instead that grant you abilities and equipment as well. Getting 6* units, not as hard as you think and does not require money. This game is more “pay for convenience” then “pay to obtain anything useful”. The game constantly gives you summon tickets and gems and drop rates are never that bad. As for 6* units, just quest and grind special quest. You will get to a point in story quest where you can grind the materials needed to awaken units and you can even track them by going to awaken units and clicking the materials to see where they are dropped. Unit with high HP? This depends on what you are going for and differs per unit used. First of all any unit can have high ho if you equip them well. There are also different kinds of tanks. Some you will want to hit on high SP with mid HP and high resistance. Some high HP mid SP depends on the abilities the unit uses. Having decent 200 sp and at least above 3500 hp for any unit is good and better if higher. Because your tank can’t always help. Last if you had a tank with just high hp let’s say you only focused on hp and got to 6000+ And you faced a Boss or unit with high magic. Well bye bye tank and hope your party can deal. Regardless FFBE is a great phone game, much better than most these pumped out Korean RPG. Super fair great combat. Also if you facing an undead enemy, PD item still kills it in one hit in this game.